Every Nissan vehicle has a cooling system that is responsible for dissipating heat away from the engine. There are many complex components that help your cooling system get the job done and they can all wear out over time. If you have a cooling system issue, the ultimate consequence is engine overheating. You can prevent engine overheating with a routine Nissan Engine Cooling System Cleanse & Fluid Exchange at United Nissan of Las Vegas. If you are experiencing any of the signs that you have a cooling system problem, the easiest and most convenient way to correct the issue is with a Nissan Engine Cooling System Cleanse & Fluid Exchange Service. At United Nissan of Las Vegas, we’ll make sure that your cooling system is restored to factory specifications. The cooling system in your Nissan vehicle is complex with many parts that require attention. Your cooling system has a water pump, coolant fluid, thermostat, heater core, hoses, pressure cap, fan, and radiator. All of these components can get extremely dirty over time depending upon various driving factors. If you drive in dirty air or on unpaved roads, your cooling system will get dirtier faster. At the heart of the dirt and grime is your radiator that performs at its best when it is good and clean. If it becomes overly dirty, it will not be able to dissipate heat away from your engine as it should. A Cooling System Cleanse is the easiest way to know that your entire cooling system is as clean as possible so it can cool your engine to the max. Coolant fluid is what carries heat away from the engine and out the radiator. The only problem is that coolant fluid becomes contaminated over time and acidic. Contaminated and acidic coolant fluid is not able to dissipate heat like fresh coolant fluid. Fluid exchange means that an expert technician will remove your old coolant fluid and replace it with genuine Nissan approved coolant fluid. 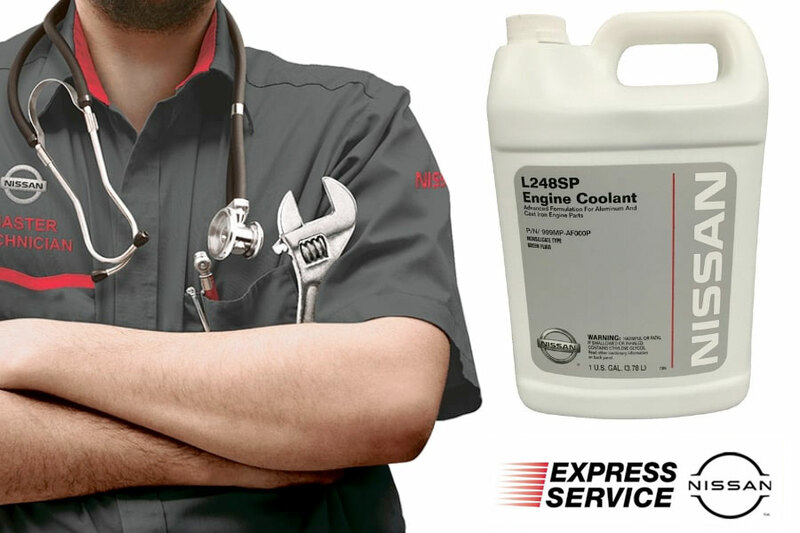 After every Nissan Engine Cooling System Cleanse and Fluid Exchange Service is completed, you’ll leave the service center knowing that your cooling system is able to keep your engine nice and cool.